The American Tract Society Building is located at 150 Nassau Street in the Civic Center area of the New York City borough of Manhattan. 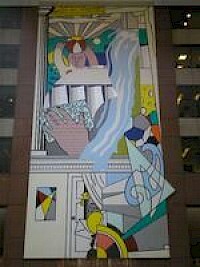 The New York City Landmarks Preservation Commission designated the American Tract Society Building as a landmark on 01999-06-15 June 15, 1999. The building was constructed from 1894 - 1895 and is one of the earliest examples of steel-frame skyscrapers in Manhattan. It was designed by the architect R. H.
Americas Tower, also known as 1177 Avenue of the Americas, is a 50-storey, 692-foot (211 m) office tower in Manhattan, New York City, standing at West 45th Street. Construction began in 1989 and was expected to be completed in 1991. This schedule was altered when construction was halted in December 1989 due to lawsuits. In February 1991, construction resumed. The tower is designed with a mixture of art deco and postmodern styles. The Sony Tower, formerly the AT&T Building, is a 647 feet (197 m) tall, 37-story highrise skyscraper located at 550 Madison Avenue between 55th Street and 56th Street in the New York City borough of Manhattan. It was designed by architect Philip Johnson and partner John Burgee, and was constructed in 1984. 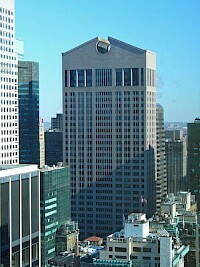 The AXA Center (originally The Equitable Tower or Equitable Center West) is a 752 foot (229.3 m) tall skyscraper located in New York City. It was built in 1986 in the postmodern style by architect Edward Larrabee Barnes and currently serves as the Headquarters for AXA Financial which consists of a number of subsidiaries of french-based insurance and baning company AXA, such as AXA Equitable Life Insurance and Mutual of New York. 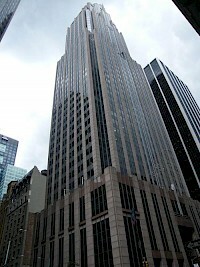 The Bank of America Tower at One Bryant Park is a 1,200 ft (366 m) skyscraper in the Midtown Manhattan district of New York City, in the United States. 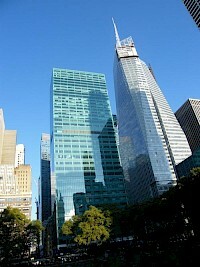 It is located on Sixth Avenue, between 42nd and 43rd Street, opposite Bryant Park. The US$1 billion project has been designed by Cook+Fox Architects to be one of the most efficient and ecologically friendly buildings in the world. 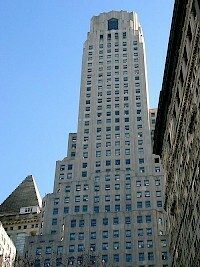 1 Wall Street, originally the Irving Trust Company Building, then the Bank of New York Building (after 1988), and now the BNY Mellon Building (after 2007), was variously a bank headquarters building and remains one of the finest Art-Deco-style skyscrapers in Manhattan's financial district. It is located in the Financial District of Manhattan and is on the prominent corner of Wall Street and Broadway. The Barclay Tower is a skyscraper located in New York City's TriBeCa near Lower Manhattan. The residential building rises 673 feet (205 m) above street level, containing 56 floors for 441 rental units. Construction of the building lasted from 2005 to 2007, with the topping out ceremony happening in Fall 2006. 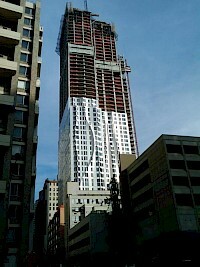 This tower block is also one of the tallest new residential buildings in New York City. 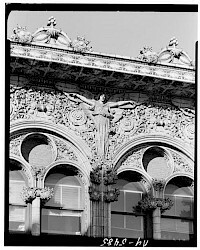 The Bayard-Condict Building, originally known simply as the Bayard Building, is the only work of architect Louis Sullivan in New York City. The building is located at 65 Bleecker Street, in the NoHo neighbourhood of New York City and built in association with architect Lyndon P. Smith between 1897 and 1899 in the Chicago School style. This commercial office building is clad in white terra cotta over a masonry wall. The Beekman Place Tower is an architecturally unique, mixed-use tower that is under construction on Manhattan Island in New York City, New York. 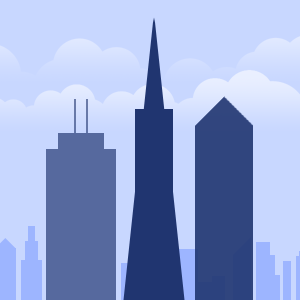 The tower, designed by architect Frank Gehry, is set to rise 76 stories and be 876 feet (267 meters) tall. Construction began on the tower in 2006 and the building is set to open in 2010. The Beekman, also known as Beekman Tower a is a 76-story skyscraper designed by acclaimed architect Frank Gehry currently under construction in the New York City borough of Manhattan at 8 Spruce Street, just south of City Hall Plaza and the Brooklyn Bridge. It is also adjacent to the main campus of Pace University. The Beekman Tower will be one of the tallest buildings in New York City.